OCTAVE MANDOLA. LIGHT GAUGE. TUNED IN OCTAVES. 12 - 44. LOOP OR BALL-ENDS. Discount available on these strings - 10% off when ordering four sets. OCTAVE MANDOLA STRINGS. 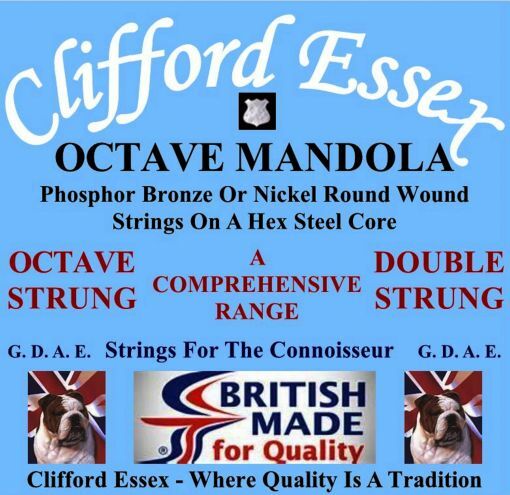 CLIFFORD ESSEX TONE TESTED STRINGS. A WIDE RANGE. Excellent, A1 staff and quality product. Quality product from a quality supplier who go that extra mile highly recommend. They are very good strings and quick delivery. OCTAVE MANDOLA. MEDIUM GAUGE. TUNED WITH PLAIN STEEL OCTAVES. 13 - 48. LOOP OR BALL-ENDS. OCTAVE MANDOLA. HEAVY GAUGE. DOUBLE STRUNG TUNED IN UNISON. 14 - 54. PHOSPHOR BRONZE. OCTAVE MANDOLA. HEAVY GAUGE. TUNED IN OCTAVES. 14 - 54. LOOP OR BALL-ENDS. PHOSPHOR BRONZE. OCTAVE MANDOLA. HEAVY GAUGE. TUNED WITH PLAIN STEEL OCTAVES. 14 - 54. LOOP OR BALL ENDS. PHOSPHOR BRONZE. OCTAVE MANDOLA. LIGHT GAUGE. DOUBLE STRUNG TUNED IN UNISON. 12 - 44. LOOP OR BALL-ENDS. OCTAVE MANDOLA. LIGHT GAUGE. OCTAVE STRUNG. PLAIN STEEL OCTAVES. 12 - 44. OCTAVE MANDOLA CUSTOM SET. SUITABLE FOR FLYDE OCTAVE MANDOLAS. 12 - 48.